Monarch (Danaus plexippus) and viceroy (Limenitis archippus) butterflies are not particularly closely related, but they appear almost identical on first glance. It's an adaptation that aids their survival. Both species taste foul; if a bird or other predator eats a member of either species, it will learn to avoid both because they look so much alike. They don’t look exactly the same, though -- if you look closely enough, you’ll see some differences -- and their behavior is poles apart. The primary visual difference in coloration is a black line bisecting each hind wing of the viceroy, a feature lacking in the monarch. Viceroys are also smaller, although exact size is hard to determine outside unless you happen to see both species together. To confirm identification, take a photograph of the butterfly and measure the item it was sitting on in order to calculate the wingspan. According to Butterflies and Moths of North America, monarchs measure 3 3/8 to 4 7/8 inches from wing tip to wing tip while viceroys have wingspans ranging from 2 1/2 to 3 3/8 inches. The caterpillars of both species feed upon plants whose leaves contain foul-tasting, toxic chemicals, the leaves of milkweed plants in the case of monarchs and willow, poplar and alder in the case of viceroys. The caterpillars incorporate these chemicals into their own bodies and retain them as butterflies. A bird or other predator eating either species would have an unpleasant experience. Unlike the butterflies, however, the caterpillars don’t resemble each other. Monarch caterpillars are striped in vivid black and yellow, which may both warn off predators and act as camouflage, whereas those of the viceroy look like twigs -- lumpy and coming in subdued green and brown. 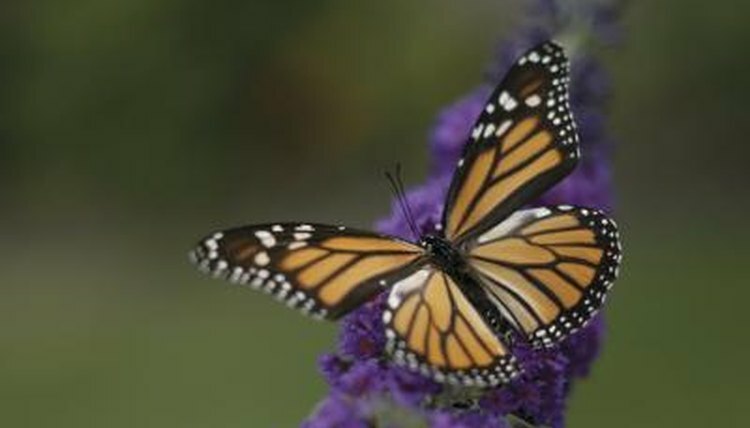 The viceroy’s distribution is limited to North America, where the butterfly's range extends from middle Canada to northern Mexico. The monarch, on the other hand, is found in North and South America, the Caribbean, Oceania and parts of Europe. Famously, the monarch butterfly migrates vast distances, overwintering in warmer climates hundreds of miles from the starting point. Viceroys overwinter as caterpillars, resting inside rolled leaves. The flight styles also vary, with monarchs taking a straighter, smoother path than the viceroy and usually flying more slowly.